This section is not intended to be a review of existing CDs. Good critics have done this already, and are experts on the subject. I wish just to draw your attention to particular works and interpretations. This extraordinary CD presents 23 works of which 20 have never been recorded. 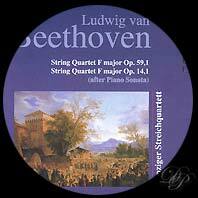 The featured work is Beethoven's "Brilliant" String Quartet in A major, Biamonti 382. It also includes 13 Counterpoint Studies written by Beethoven for his teacher Albrechtsberger and the rare String Quartet version of the world famous "Andante Favori," WoO 57 and a dozen other remarkable rare, never before heard, works. 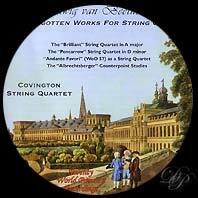 All of these special pieces are performed by the Covington String Quartet who has been receiving extraordinary praise for thier recent performances in the US. This is a delightful, refreshing CD from begining to end. Fugue for string quintet, opus 137. Arrangement of the sonata for piano opus 14 no. 1, Hess 34. A very complete booklet, by Bernard Fournier, completes this little gem. 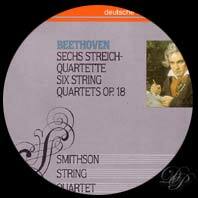 String quartet opus 18 n°4 and opus 59 n°3, by the Schuppanzigh quartet, playing on Beethoven's string instruments. 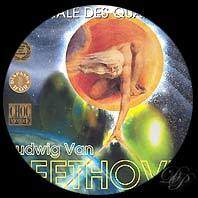 Published by Ars Musici in cooperation with Deutschland Radio, 1999. Some years ago a conference was held at Bonn with the subject of setting up a quartet of violin, viola, cello and double bass on Beethoven's own instruments (those given by Prince Lichnowsky). Here are the references on the CD which has been edited by the quartet and which is now on sale at the BeethovenHaus at Bonn: string quartet opus 18 n°4 and opus 59 n°3, by the Schuppanzigh quartet, playing on Beethoven's string instruments. The "Schuppanzig Quartet"s playing of the two great quartets Op.18 no.4 and Op.59 no.3 is impeccable. Their tempi is overall rather fast, considerably faster than my reference recordings by The Amadeus Quartet. The 4th movement of the Op.59 no.3 is played in breakneck speed. In the 4th movement of Op.18 no.4 we get a little extra bonus: a cadenza by the 1st violin after the fermata in measure 116. I have not heard anything like that in other recordings. The Schuppanzigs play just as the performance practice in Beethoven's days by all probability was: Very little vibrato (for example the Introduzione to the 1st movement of Op.59 no.3, the sustained notes there are practically vibrato-free), the animation of longer notes by means of crescendo and decrescendo giving the tone a "swell", and liberal use of open strings. It is a pleasure to listen to the four instrments' different "character". We have rich opportunity to do so in the 2nd movement of Op.59 no.3, which in my view is that quartet's climax. The viola's sound is particularly beautiful, just listen to the measures 25 and onwards where it takes over the main theme. The viola is the best preserved of the four (by the way, that instrument has a highly original form, with convoluted edges and f-holes). Unfortunately, the scholars are not 100% certain as to whether all four instruments in fact ever were in Beethoven's possession. The box of seven CDs is hailed by all music critics, and justly so! A booklet briefly presents each work: history, influence and composition. 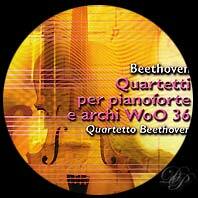 In 1828, three string quartets 'composed by Beethoven' were published in Paris. In fact, they were arrangements of the three piano sonatas Opus 2. It might seem curious, and a real non sense, to create string quartets from piano sonatas. 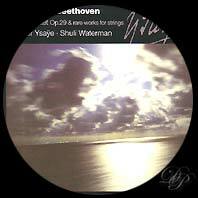 But Beethoven had done this with his piano sonata Opus 14 around 1801-1802. Beethoven frequently lost his temper with composers and music editors who encouraged the arrangement of works for "instruments which are opposing in every respect". He deemed that only the composer of a sonata for piano may transcribe it for string quartet. The CD also includes the quartet opus 59-1. Opus 18, no 6 : Quartet no 10 opus 84 "La Malinconia" by Elenairsova. A very interesting experience and one which merits more than an inattentive listening, and which displays well the brilliant composer Beethoven was. The Gewandhaus Quartet offers us this superb box set of high quality (14x25.5 cm) for this complete set of string quartets. Their sound is luminous and the pleasure is there for the taking. The box also includes the sonata 14 no. 1 adapted for string quartet, as well as a conversation with Martin Hoffmeister. The booklet, of which 36 pages are in French, presents the history of the Gewandhaus Quartet and each of the 16 string quartets of Beethoven. Besides this, the lay out of the pages is clear with a descriptive text where necessary. The ear, the eye and the spirit each find pleasure with this set. 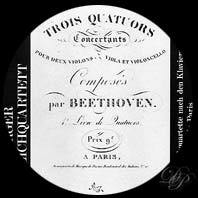 Gustav Mahler made many arrangements of the works of Ludwig van Beethoven, notably the quartet in F minor opus 95, the “Serioso”. He justified the arrangement for string orchestra by claiming that it makes quartets (and particularly those of Beethoven) more accessible to the general public as they appreciate orchestral works more than chamber works. I myself love these arrangements: the additional instruments do not in any way impede the greatness of these works. A strongly recommended CD. Also on the CD, the string quartet of Franz Schubert “Der Tod und das Mädchen”. 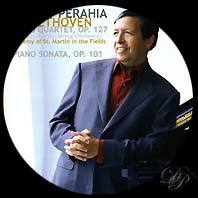 Murray Perahia conducts the strings of the Academy of St. Martin in the Fields for a full and strong performance of this quartet of Beethoven. It is at one and the same time the same work, and also different, more rich but less personal, which the listener discovers. The quartet not having sudden arrangement, every note is carefully presented, the sound is serene and transports us towards new summits. Also on the CD, the pianist performs the Sonata for piano opus 101, in a new critical edition in his hand. 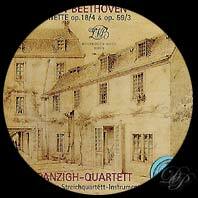 In 1785, Beethoven composed three quartets for piano, violin, viola and cello. Published after his death, but still 1827, the three works are of a composer who was still only 15 years of age are very pleasant. One finds the influence of Mozart and Clementi, for example. The Smithson String Quartet performs the six first string quartets of Beethoven on instruments of the 17th and 18th centuries. The result is neither exceptional, nor of bad quality. The sound is agreeable. Perhaps it is missing some more marked attack and a more enhanced joy, more impassioned? Look for it in second hand sales. Jaap Schröder, violin (Cappa 1684), Marylin McDonald, violin (Stainer 1665), Judson Griffin, viola (Alban 1710), Kenneth Slowik, cello (Grosset 1748).